My family took a road trip down to Pasadena to attend a wedding. We are staying at a hotel in Old Town Pasadena, an area within Downtown Pasadena. ‘Lette Macarons was on the bride’s list of favorite places in the LA/Pasadena area. 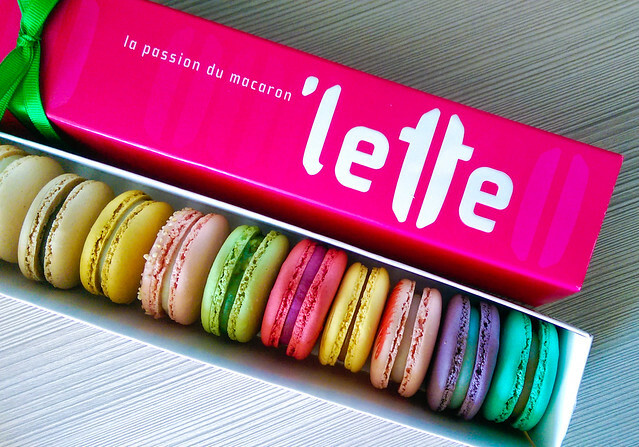 ‘Lette is a macaron chain located in Southern California at Beverly Hills, Newport Beach, Glendale, Los Angeles, Pasadena, and San Diego. After purchase we recommend keeping ‘lette macarons in the refrigerator; let them come to room temperature before serving—about 10 minutes. For best degustation, our macarons should be consumed within 3 days. The tip generally applies to any macarons. I wish I had known this earlier! It does make a difference when you “thaw” it for 10 minutes or so, to soften the ganache (filling). I shared the macarons with my mom, by cutting each in half so we could try all of the flavors! We concluded that the almond macaron was the best. I liked the salted caramel and earl grey tea macarons as well. What are your ‘Lette favorites?